The recycled light-up Christmas gift boxes no longer look faded and old. They have been restored somewhat to a still very useable outdoor christmas decoration. I had two which were snow-white to begin with, but over time however, they had faded to a dingy yellowish color, and some of the material used to make these boxes was chipping off on the corners. The lovely ribbons and bows that were glued on for decoration when I first bought them, were now ripped and hanging by threads as well. I almost considered retiring these things back to the basement forever. But thankfully, all inside lights were still intact and work well. It would have been a waste not to revive them. 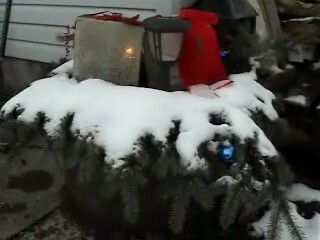 And, who can afford all new outdoor christmas decorations every year? Certainly not everybody. It's rather easy to restore glowing outdoor christmas present boxes back to what they were if you have some scrap materials around. If you have these outdoor plug-in christmas gift boxes, just treat them like you are wrapping christmas presents as usual. I stripped the old ribbons off and gave the boxes a light brushing to get rid of the materials that were chipping. I was going to attempt to wash them somehow, but settled for just the overall brushing. I made sure the lights still worked and changed a bulb or two. I then went on a hunt for the leftover christmas wrapping scraps. I flattened out the wire on the inside of the box, and it seems to be holding the bow securely in position on the box quite well. I found some wide leftover scrap silver ribbon that bends and has some wire through it as well. This is the kind of ribbon that is great to shape whichever way you want on gifts. Didn't have much, but what I had was enough to fasten flat strips with a heavy clear tape onto the box. Just put a few rows on top and that was it. I followed the same procedure with the second box, only with a smaller red bow that had a nice little gold bell ornament on it, tied on a small gold thin christmas tree ornament that came attached to a gift last year, and also found some more ribbon which was gold and red in a plaid design. 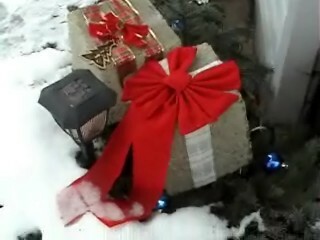 Didn't have enough ribbon actually, but situated it beside the other box to hide a missing space. I will add a few more rows down the sides I think of a solid color. More boughs will cover up the spaces too quite well. The few lights in each box at night just light up these christmas boxes just enough that I think they look pretty. 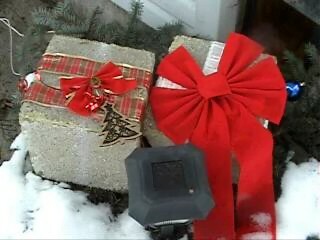 These recycled plug-in christmas gift boxes are just sitting side by side in a large planter filled with spruce boughs, so they are certainly exposed to the weather, and consequently will be covered with some snow and icicles most of the time. Now if the experienced crafters got really up close and personal in the daylight, they'd probably rip my efforts to pieces I've no doubt. But these are meant to really show at night I think. And, they do. The big red ribbon shows up so well from the low light when plugged in. It's been fun to breath new life into these outdoor decorations. As long as the box frames are intact and the plug-in works, definately make the effort to redecorate and revive them the way you would like if the ones you have now are looking pretty ratty. I'm sure the weather will take its' toll on the bows by the end of this winter, but I'm prepared to make recycled light-up christmas gift boxes all over again next year with decorations altogether different. This is the fun of it; I didn't have to spend anything, and yet it still feels like I got something brand new anyway.